I am a child of the sixties. I graduated from high school in 1970. Interesting times. It wasn't until the very end of my high school years that we were allowed to wear pants to school on the very coldest days and we absolutely were never ever allowed to wear blue jeans to school. I, along with my contemporaries graduated, went off to college, changed into jeans and rarely took them off. 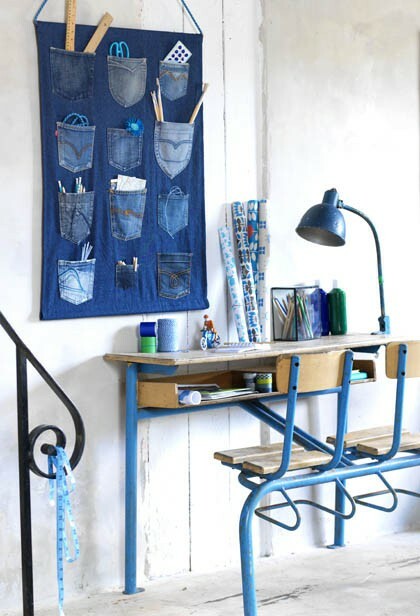 Denim blue jeans are comfort clothes, and denim in décor and design is comfort décor. For months I have been collecting denim resources. Last week on the trip to the local transfer station I stopped in the swap shack. This is a shed where people put items too good to toss but they no longer need. Free exchange and recycling at its best. There I discovered 12 pairs of blue jeans in sizes ranging from 4 through 14. I have been waiting for just this type of find - resources for a project. In Pinterest I've been collecting denim ideas. 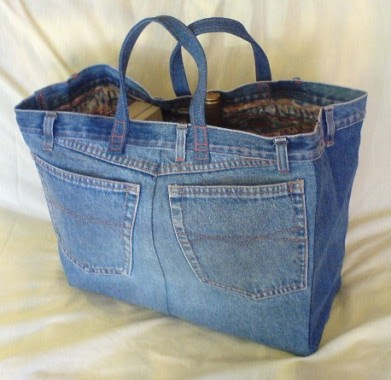 The interweb is filled with creative blue jean ideas. I'll share some ideas over the next few days. Today I'll focus on denim pockets. 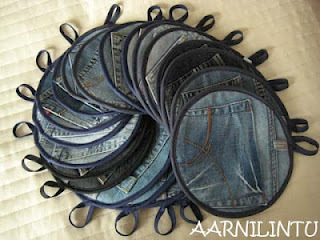 Here are some great ideas for recycling jeans pockets. Check out these round beauties from Finland. 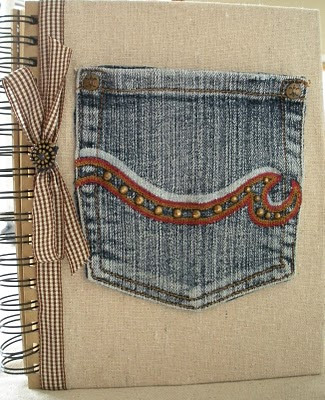 This notebook cover combining ribbon and a denim pocket is stunning, although in this digital age my notebook use is nearly nil. 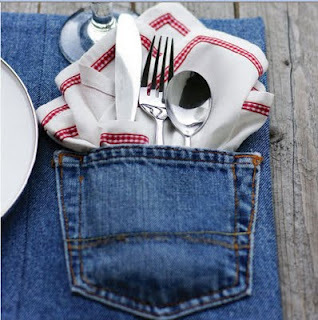 This placement makes great use of the pocket for the napkin and silverware. I could have written the first paragraph word for word. I've been saving my family's old jeans to weave into rugs. 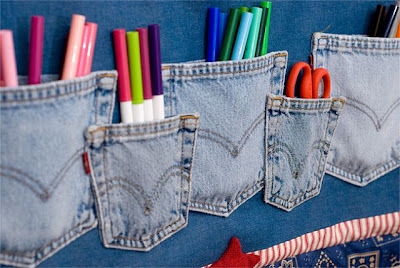 Now, here are some ideas for the leftover pockets. Judy, thanks for visiting and commenting. It has been a great 42 years since HS graduation! Are you a gramma yet? Marji, I've been reading your blog for a while now. It seems your taste is much like mine. You rarely post anything I don't find interesting. I'm trying to start a blog, but it's slow going. I have 2 daughters but no grandchildren yet. My elder daughter is working on a PhD in biology and my younger daughter is an artist. Sorry for the slow reply. i have been vacationing!!!!! I have found blogging to really inspire me to create and to share. I had been an art teacher years ago (my degree is in sculpture) but had stopped most creating for years. Blogging (plus retiring from 1 job) has really got me going agin. Feels good! So keep at it. Thanks for the comments everyone, Just back from vacation so I got a little behind on replies. Still collecting denim ideas though. More to come.